These new models pack Triple Sensor and temperature and direction readings into a 100M water resistant design that is perfect for sports, work, or other activities that involve water. 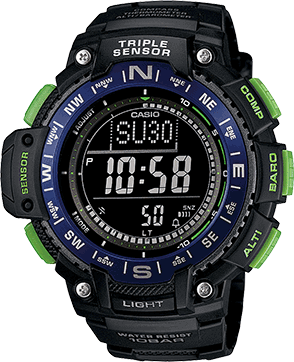 In addition to world time, stopwatch alarm, and other basic timekeeping functions, these models also include a direction sensor and temperature sensor. Direction readings and time are indicated by large, easy-to-read figures. A large LCD is divided into three segments for a clear, easy-to-understand presentation of data. Mineral glass is used to protect against scratching.